Both species of sailfishes grow quickly, reaching 1.2-1.5 m (4-5 ft) in length in a single year, and feed on the surface or at mid-depths on smaller pelagic forage fish and squid. Individuals have been clocked at speeds of up to 110 km/h (70 mph), which is the highest speed reliably reported in a fish. 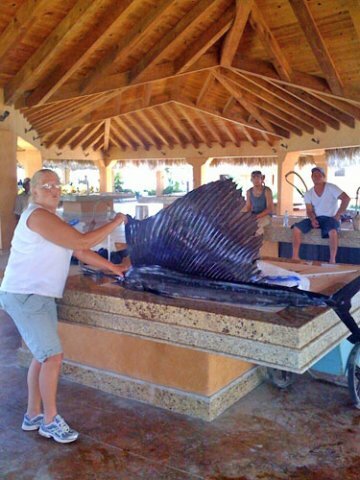 Generally, sailfish do not grow to more than 3 m (10 ft) in length and rarely weigh over 90 kg (200 lb). The sail is normally kept folded down and to the side when swimming, but it may be raised when the sailfish feels threatened or excited, making the fish appear much larger than it actually is. This tactic has also been observed during feeding, when a group of sailfish use their sails to “herd” a school of fish or squid. Sailfish are highly prized game fish and are known for their incredible jumps. The sailfish can also rapidly turn its body light blue with stripes when excited, confusing its prey and making capture easier, while signaling its intentions to fellow sailfish.